Despite a strong second-half performance that merited a goal, the Bannsiders were eliminated from Europe as goals from Mile Savkovic and Bojan Cecaric helped ease the Serbians into the next round. 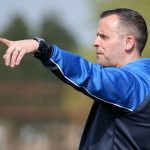 Stripes boss Kearney admits he couldn’t have asked for any more from his players, but was a left a bit frustrated as his side couldn’t find the back of the net after creating several opportunities. “I just feel that was a massive chance missed for us tonight, but not through fault of our own,” Kearney said. “The boys put in a massive shift over the 180 minutes, we couldn’t have asked for any more, particularly in the second half. “I do believe that if we had scored at any stage there, because we were on the front foot, we probably would have went on and got the result. “We probably created enough chances to win three games tonight, normally we are very prolific in our finishing, but on the one night you need it, and against a goalkeeper who had a night to remember, it just wasn’t to be. “You have to put the ball in the back of the net at any level, particularly at this level. “The first goal tonight was always going to be a catalyst, and if Aaron Burns effort goes in, if Stephen O’Donnell’s goes in, if Jamie McGonigle’s goes in, if any of them go in it flips the game again. 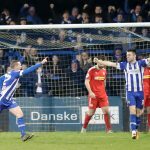 It marks a second successive season that the Irish Cup holders have been involved in European competition and Kearney was delighted to see his side show signs of progression after last year’s 7-0 aggregate defeat to Haugesund. “Credit to the boys, we have all learned a lot from last season,” Kearney added. “We were probably too expansive too early last year. This year we saved it for the last 30 minutes when the tie was really alive. Whilst being disappointed with the result, the home side had reasons to cheer as James McLaughlin made a competitive return from a cruciate knee injury sustained last year. 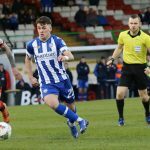 The striker was given a rapturous applause when he was introduced as a late substitute and Kearney believes the 28-year-old will be a ‘huge asset’ as the start of the new Danske Bank Premiership season draws near. “It was great to see James back out on the pitch,” Kearney continued. “We have purposely put the reins on him because although it is pre-season for everyone else, his time frame is slightly different which is being led by the doctor and Alan Millar who has been brilliant with him. “The key thing for James is bringing him back when he is ready, not when the season starts. Hopefully we will get him 45 minutes against Limavady and that will start his rehab from a footballing point of view. “His return is a huge boost because he puts the ball into the back of the net and already in training he hasn’t lot that aspect to his game. “The priority is to make sure he is safe to go and get him out there and getting the knee strong enough.